Coast Guard finds $12 million in cocaine on suspicious fishing vessel near Colombia. More than $12 million of cocaine seized by the Coast Guard near Colombia was offloaded in St. Petersburg Wednesday. The massive haul was offloaded by Coast Guard Cutter Hawk after it was seized by the Cutter Gallatin on Nov. 4, according to a news release from the Coast Guard. Officials said the Gallatin, a 378-foot ship home-ported in Charleston, S.C., stopped a suspicious fishing vessel that was flying a Panamanian flag just north of Colombia. The Coast Guard received permission from the Panamanian government to board and search the vessel, and that's when they discovered 14 bales that later tested positive for cocaine. 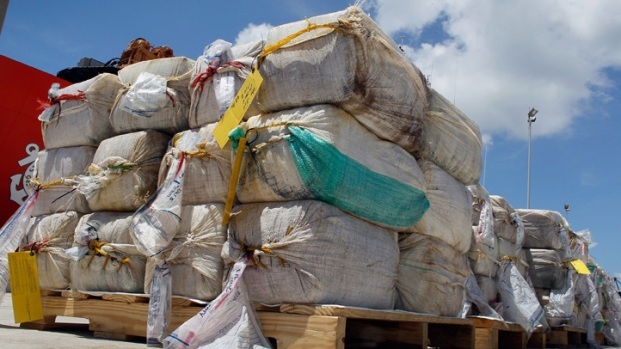 Five Colombians were taken into custody as smuggling suspects. The seizure and arrests were part of Operation Martillo, which targets drugs, weapons and cash in Central America.